The setting of this church is so obscure that it had taken me three attempts to find it. It is clearly shown on the OS map, but access to it was another matter. It is probably no more than 300 metres from the nearest road, but the lane which heads off by the former gatehouse is across private land with no access. So, you must carry on until you reach a long, narrow lane, signposted to 'Didlington Nurseries', which leaves the road about a quarter of a mile to the north. This then heads east, south and then finally back west for about a mile and a half. Don't expect to be able to easily pass anything you meet on the way. The lane is gated just before the church, and this is where you enter private land. I came here with American church explorer David Striker, and we left the car just inside the gate (parking outside it is impossible) because we didn't want to intrude too far. We had only been in the church about five minutes when a very nice but rather formidable lady came in to find out who the car belonged to. She told us that she would normally expect people to drive right up to the church - and, indeed, there is a track. Peter Stephens tells me that when he came this way he was met just inside the gate by a very large, very enthusiastic and very loud dog, which was impetus enough for him to take his car as close to the church as possible. While engaged in the long circular drive, you may wonder at the open field and woodland which the lane circumnavigates. In fact, this was the site of Didlington Hall itself. The Hall was vast and idiosyncratic. As The Amhersts of Didlington website puts it, by the turn of the twentieth century, the Hall had expanded into a sprawling Italianate mansion, reputedly with eighty bedrooms. In the end its sheer size was its downfall; the house was demolished in the 1950s as no one had the money, staff or desire to maintain it. The church is set in the grounds of the former stable block, vast enough in itself goodness knows, and this is the reason for the long parabolic journey from the road. However, the upside of this is that the owners are good custodians, and leave the church open during the day. Few open churches can be so spectacularly well-protected. 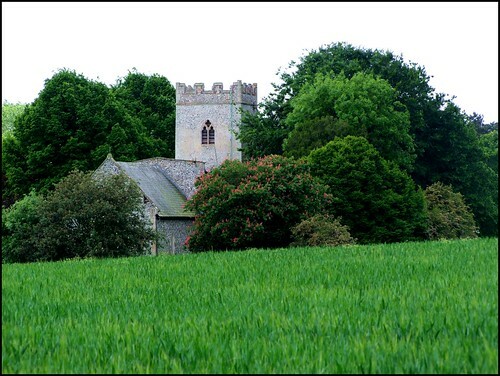 Sam Mortlock rather damns the church with faint praise by calling it simple and unassuming, but in a different setting this would appear rather a grand church, and its size would be more apparent if it was not huddled here in a fold of land, surrounded by trees. At first, it appears to be all of its 19th Century restoration, but once you get past the rather imposing east window you can see that this is a church which was pretty much the work of the late 13th and early 14th centuries. As we wandered around the north side, one of the fattest rats I've seen in a long time looked surprised at an unexpected visitor, but then decided that continued exposure was probably not a good idea, and disappeared into its hole by the former north door with an audible plop. We headed on, around the tower to the south doorway. Stepping inside, Mortlock describes the interior as extremely stark, but there is rather more to it than that now. He found the nave and aisles completely bare, and glass panelling and a heavy curtain cordoning off the chancel. This has now gone, and the nave, a large, open space, is filled with simple modern chairs. Its aesthetic suits it very well to the modern Anglican age. Despite the remoteness of the setting, it felt like we were entering a well-used and cared for place. Aside from the furnishings, the interior is almost entirely 19th Century, but there are some interesting and significant early survivals. The late medieval roof is set on corbel heads which all appear different. The familiar 13th Century Purbeck Marble font, which you might have assumed was original to the building of the church, is set on a less usual late medieval pillar, suggesting that it was brought here in later years, perhaps by the Victorians. On the western wall above is a rather lost-looking stone royal arms to Victoria, which would be imposing in a smaller church. An acquisition which reminds us of the glory of Didlington in former years is the opulent set of white marble communion rails, which Mortlock thought might be a result of the 18th Century 'Grand Tour' - they were probably originally intended for an Italian balcony or terrace. Also rather startling in the chancel are four imposing memorials, three of them to men named Robert Wilson, decorated with a variety of figures, skulls and hourglasses according to period and taste. The fourth, although more recent than the others, is perhaps the most interesting, being a memorial to Mary Tyssen-Amherst, who died in 1854. The Tyssen-Amherst family had bought Didlington Hall in 1843. Among other things, they married into the Mitford family, who brought Cleopatra's Needle to England. This connection seems to have given the Tyssen-Amhersts an interest in Egyptology, because they built up a fabulous collection of Egyptian relics and remains here at Didlington, most of which are now in the British Museum. By one of those twists of English history, the Tyssen-Amhersts employed a Swaffham-based artist to redecorate the Hall during the later years of the 19th Century. He would bring his young son along, who, bored, would wander through the long galleries of Egyptian artefacts. As you might imagine, the young boy became fascinated with them. His name was Howard Carter, and in 1922 he would himself finally uncover the greatest Egyptian treasure of all, the tomb of Tutankhamun. But all that was in the future. Mary Tyssen-Amherst's memorial is quite unlike any other I have seen of the period, with balls of foliage peered out of by very Victorian-looking wild men, an angel holding a book while other angels flank and appear to venerate a tree, and the Lamb of God sailing through the empty wastes of marble above her inscription.